Oh, this would be dangerous for me. Probably because Mel wouldn’t touch it “too sweet” or “too creamy” and then I’d eat it all! Wow! I am completly WOWED!!! I love Carrot Cake, this is perfect. YUM. I haven’t had a better than cake in a while and a carrot cake twist on it is amazing! Oh my GOODNESS, this cake looks delicious, and I already love carrot cake! Oh my word… I would love to dig right in! I want to make this but what is whipped cream cheese? I have never heard of it. Also do you pour this over the cake while it is warm? I would be all over this like white on rice! Oh my goodness! This sounds fabulous. I love poke cakes and cannot wait to make this one. I LOVE CARROT CAKE!!!!!!!!!! That is all. I love you too Ashton!! 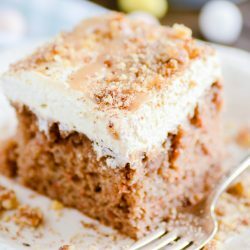 I’m not a big carrot cake fan either but this sounds wonderful! And I love the name! Got your email. Thanks for the response…I do want borders on my blog…having the most problems withe size of my header though. I wasn’t as specific as I thought…anyways…I made this today. Great recipe. Love that cool whips frosting and my store had cream cheese flavor! I love the twist you did with the name, so cute! I’ve never noticed Cool Whip frosting, I’m going to have to make sure to look for it. 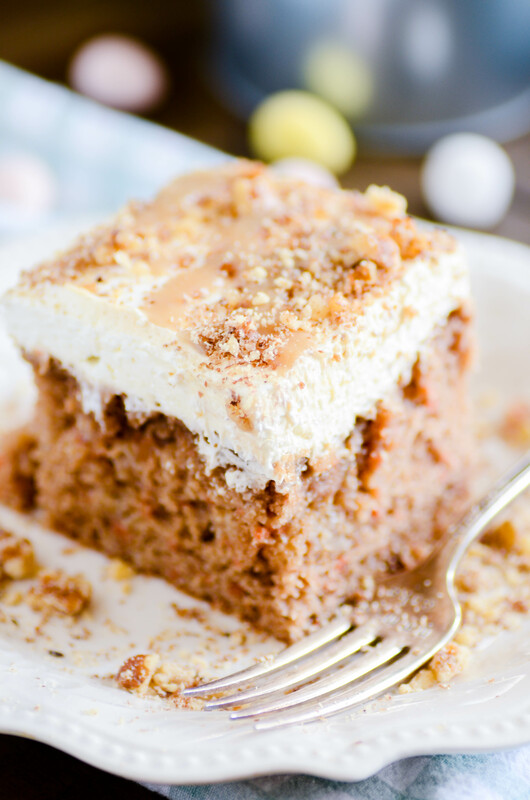 Carrot cake is also one of my favorites, I think I’ll have to make this to take to my Easter lunch and dinner! Would it be possible to leave out the whipped cream and just use the Cool Whip and Cool Whip frosting if I’m in a pinch? What is cool whip frosting? I’ve never heard of Cool Whip frosting. Is this something new? Is it found in the refrigerated section? It’s right by the cool whip :) It’s AWESOME! i can’t wait to make this!! but i am curious as to what leaving the regular cool whip out would do. it seems like a lot of similar things for the icing. You just have to trust me on this… or don’t I guess :) But it just works. The frosting needs more volume than what you get in the frosting tub of cool whip frosting, but using two would be WAY too overwhelmingly sweet. The regular cool whip evens out the taste, fluffs up the texture. I’m so making this for Easter! Quick question: I already have a tub of the cool whip cream cheese frosting in my freezer….do i still need to get the regular cool whip to mix with that one, or do i for-go that whole step and just use the tub of the cream cheese cool whip? I like to mix the two– I think it makes for a better texture and flavor :) Plus… there’s MORE of it! I want to make this for Easter dessert. I can’t find cool whip frosting anywhere. Can I use regular frosting? MY grocery store – a terrible store, trust me, has never heard of Cool Whip Frosting. Can I make it with two things of Cool Whip and the Whipped Cream Cheese? I pretty much think I have to at this point. This sounds great!! If my store does have the cream cheese flavored frosting do I need to get the whipped cream cheese as well?? So my store doesn’t have cool chip frosting, is it still good to make with out it? 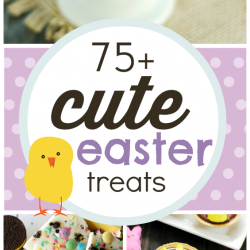 Im hoping to make this tomorrow for Easter but wont have the time to hunt down the cool whip frosting. I made this cake today for Easter Sunday. I couldnt wait to try it so I went ahead just now and a piece. It was AWESOME!!!!! I love it! Its a keeper for sure. Cant wait til the family try it tomorrow. I bought the cream cheese flavor cool whip frosting. Do I still need the whipped cream cheese? Also, the size of the cool whip frosting is 10.6 ounces. 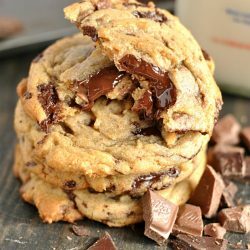 Is the size listed in the recipe a mistake? Thanks! Can’t wait to make this! How would this cake taste without the sweetened condensed milk, I am making this right now and am having reservations, I just don’t want it to be TOO sweet. Any suggestions? Hi! Making this for Easter sunday! Does the cool whip and cool whip frosting have to be completely thawed, or should I keep it in the freezer until ready? Excited to try it! Sorry I missed this! I was out of town for Easter myself! But for future reference, everything needs to be thawed. Could you please take a picture of all the ingredients in this cake so we know what to be buying, I think we’re all getting mixed up with the cool whip frosting I was thinking it was frosting by the cake mixes but now I’m reading the comments and it sounds like its in the freezer section…a picture would be great for all the ingredients:) thank you!!! Can’t wait to try this! Yep– it’s the cool whip frosting in the freezer section :) It’s just a new product, that’s why it’s confusing. And this recipe does call for 2 different Cool Whip products. Cool Whip (normal) AND Cool Whip Frosting. I made this yesterday for us to eat today at our Easter meal. I’d suggest a few things: 1) don’t add the caramel till just before serving 2) don’t use the entire can of sweetened condensed milk. The cake was way too “wet” for my taste. I’m familiar with the BTS cake (chocolate version), but cutting back on the milk to maybe half of what is called for would help. Don’t get me wrong, everyone loved the cake. It could just be fine tuned a bit more. This something my daughter Hope would love because Carrot Cake is her favorite cake. I would love it too. Am going to have to adapt it for two to four people. This was the best cake ever!!! My husband doesn’t even care for carrot cake, but he ate half of this cake!!! It was so rich and delicious and really not all that hard to make. I just made this cake for easter!!!!!!!!! I really enjoyed making this cake and am hoping that my family really likes it also!!!!!!!!!!! Oh, how I love Carrot Cake. 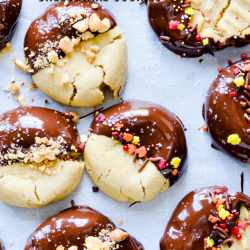 I’d love to make this, but too many carbs for us diabetics. Darn!! This is truely the best carrot cake ever!! I made it for my husband for our anniversary and he is still raving about it!! I am curious though is it really 1600 calories per piece?! I must admit, this cake sounds very delicious. 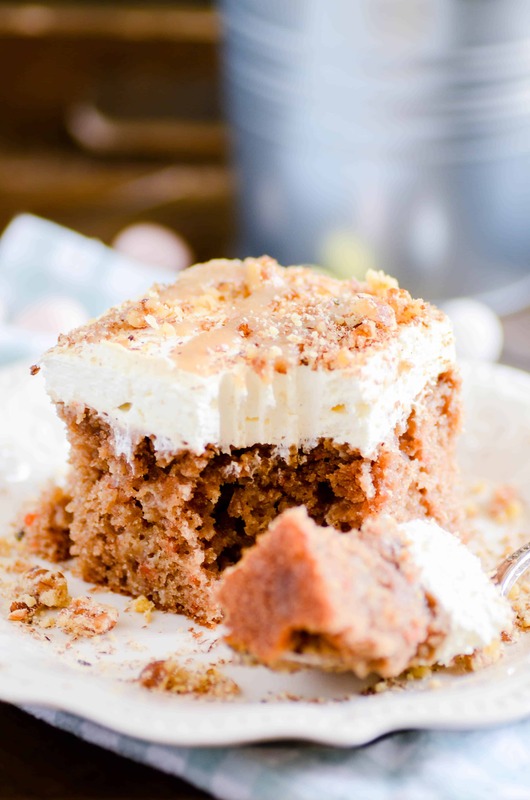 Even the ‘traditional’ Carrot Cakes made from ‘scratch’, & topped w/ homemade Cream Cheese Frosting aren’t t the ‘healthiest’ of desserts….but this one (w/the addition of Sweetened Condensed Milk, Canned Frosting, and Caramel Sauce) is truly a ‘Gut Buster’! I definately wouldn’t serve this cake to a diabetic, or to anyone who has heart problems, nor to anyone who is trying to watch their weight. Go for it, if you dare! Anyways, it does sound very tempting! I made this poke cake for a dinner at church tonight and let me tell you everyone loved it even some men that I thought didn’t eat sweets. I am now hooked on poke cake. Can’t wait to try mt next one. Thank you so much.